The refrigerator is a hard-working, essential kitchen appliance. If you think about how much you use it, you can see just how important it is. Even more so, it is imperative to have a well-built model because the fridge is the only appliance that runs all the time. It operates 24 hours a day, seven days a week, every single day of the year. You never turn the fridge off. Because of this, it is mandatory that your refrigerator adheres to high standards for quality and that it functions well. You want something that is easy to use and that suits your needs. It should provide enough room and allow you to get items from inside easily. You use it multiple times a day, so it needs to make your life easier, not harder. 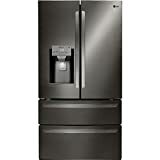 With these things in mind, we have decided to review the Samsung RF28HDEDBSR refrigerator. We will give you some background on the company and brand, so you can get to know a bit more about the commitment behind the product. We will go over the full specifications, talking about the main features and design points. We will also discuss pricing and look at the pros and cons of this model. To round things out, we will also help you with a little comparison shopping to see what other brands offer at this same price point. We feel after reading this full review of the RF28HDEDBSR, you should have enough information to make an informed buying decision. Samsung is more than likely a name that you have heard. You may even have owned Samsung products in the past or currently. The company is very well known for its television lines and its very popular Galaxy smartphones. As a leader in electronics, the company has pushed its own boundaries to branch out into products such as refrigerators where it can showcase its strong sense of design, make an impact with new technology and continue to strive to help make people's lives easier and better. Samsung began in 1938 in South Korea. At that time, it was just a trading company. It took a while for the company to start manufacturing operations, but in 1969, the company started to make televisions, which has become a flagship product. Samsung began making refrigerators in 1974. It was quick to introduce new technology and innovations in its refrigerator lines. This includes being a leader in energy-efficient products, introducing the door-in-door concept and leading the way for WiFi-enabled appliances. The newest idea is the FlexZone, which uses Cool Select technology to create a space in the appliance that allows for adjustable temperatures. It can be a fridge space or freezer space or something in between. Today, Samsung is one of the 10 global brands. It is still family-owned, though, so it stays true to its core goals, which include helping to make life easier and better for its consumers. It focuses seriously on product development and bringing innovations to every product it creates. 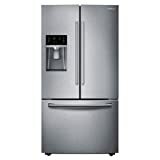 The Samsung RF28HDEDBSR is a French door refrigerator. It has the fridge on top, which has French doors that open out to the sides from the middle. The freezer is a drawer style at the bottom, or rather, it actually has two drawers for the freezer section. The unit has a total capacity of 28 cubic feet. The RF28HDEDBSR has a couple of interesting and unique features that help make it a higher-end product with a bit of additional technology. The main feature is the Food Showcase. This is a door-in-door concept. You squeeze the door handle to pop open the front pane and reveal a small storage area where you can keep commonly used items, such as beverages. You can also see through to the refrigerator contents through this panel. Another nice feature is the CoolSelect pantry. This is kind of like the FlexZone technology that allows adjustable temperatures, but it is within the fridge at the very bottom. This drawer has three possible settings: deli, fresh and chilled. It does not freeze. It is ideal for thawing meats or keeping beverages at an icy cold temperature. The RF28HDEDBSR features LED lighting throughout. This allows for more streamlined lighting that does not take up space in the interior. It is also super bright, allowing you to see in every single area within the refrigerator. You also get the EZ-open handle on the contoured doors. The unit also has CoolTight door technology to help ensure a perfect seal, along with a two-minute door alarm that helps avoid keeping doors open for too long and lowering internal temperatures. With the fridge doors open you need a bit more clearance. The depth becomes 49 inches. The function of the unit is kept on track thanks to metal cooling. The stainless steel paneling aids the compressor in keeping the interior at a consistent temperature. It also has Twin Cooling Plus, which ensures food freshness by maintaining high humidity in the fridge and low in the freezer. Surround flow air technology also assists and ensures the temperatures are on point. Finally, this unit has Power Freeze and Power Cool settings that let you quickly get the interior back down to the right temperatures after adding in warmer food items or keeping the doors open for too long. With the RF28HDEDBSR, you get an external water and ice dispenser. It has an LED lit control panel for easy use, even in a darkened kitchen. It has a tall design so that it can accommodate pitchers or water bottles. You can choose crushed or cubed ice from the Ice Master icemaker. It will produce up to 10 pounds of ice per day. It holds up to 4.2 pounds of ice. It also has a space-saving design, so it does not take up a lot of interior space. In the fridge, you get 18.9 cubic feet of space. There is a total of five tempered glass shelves. This includes one extending half shelf, one foldable shelf, one slide-in shelf and one slide-out shelf. All shelves are spill-proof for easy cleanup and minimizing messes. You also have a total of seven bins. These include two gallon-sized bins and two humidity-controlled crispers. There is also a dairy compartment in the door. The freezer has a total capacity of 8.93 cubic feet. It has one drawer divider. It also has two-divider opaque bins. A special feature that you will find especially nice if you love pizza is the in-door pizza pocket. Just slide your frozen pizza in to keep it from getting broken or damaged in the drawer. It also allows easy access when you really need a hot cheesy slice. The warranty offered is pretty good. You get a one-year parts and labor warranty on the whole unit. You also get a five-year warranty on the sealed system, which includes parts and labor. You have a 10-year warranty on parts for the compressor and a five-year warranty for labor on the compressor. The RF28HDEDBSR is sold directly by Samsung, but you can get it from other appliance retailers or stores that sell refrigerators. The suggested retail price from Samsung is $3,199. However, deals and discounts are always available. Currently, if you buy directly from Samsung, there is an $884 discount for a price of $2,315. You can also get financing from Samsung and make payments over time. As mentioned, though, you can buy this from a variety of retailers. They often offer lower prices and bigger discounts. Home Depot is selling this unit for $2,197.80. Best Buy has it marked at $2,199.99, and Lowe's saves you $0.99 by pricing it at $2,199. If you have a tighter budget, don't give up hope of owning this unit. You can actually find pieces that are not fit for regular retail sale at places such as Sears Outlet. The units carried by this store often have minor cosmetic issues or were used as floor models. They are not in perfect condition, but they are new and have not been used. Plus, the savings are huge. Right now, Sears Outlet has this model starting at $874.99. When shopping for a high dollar item, such as a refrigerator, it is important to make sure that you look at all your options. It becomes even more essential to ensure you are getting the best possible product for your money when that product is as vital as a fridge. You want to be sure that you buy something that is going to last and function properly. With that in mind, you need to do some comparison shopping. We went ahead and did it for you. Below we present you with the information you can use to compare the Samsung RF28HDEDBSR with three other refrigerators from other brands at the same price point. This is a well-made refrigerator. It offers a lot of versatility and has many features that elevate the overall value. The door-in-door option is very usable and handy. Many people are unsure when they buy it if they really need this feature, but it is soon apparent that it is incredibly nice to have. The overall function of the fridge is great with consistent temperatures that keep food fresher longer and allow for great food storage. This Electrolux model is also well-built. It is counter-depth, which the Samsung is not. It also is a side-by-side and not a French door style, which may be an issue for some people, as the freezer portion often becomes difficult to use due to the vertical setup and its narrowness. This fridge does have a Chill Zone drawer, which is a lot like the CoolSelect pantry in the Samsung. It also has a Fast Freeze function, like the Power Freeze in the Samsung. As for the warranty, it is not as extensive as the one for the RF28HDEDBSR. You get three of year parts coverage and one year of labor coverage. You get a little more for your money with this LG model. It is WiFi-enabled and uses SmartThinQ technology. It is also a French door style, but this has double freezer drawers for even more ability to organize your freezer section. The warranty is one of the best in this industry. You get a one-year warranty on parts and labor, five years on the parts and labor for the sealed system, and then five years on the labor for the compressor and 10 years on parts for the compressor. While you are paying the same for this GE model as you do for the Samsung, you are not really getting as much for your money. The only main feature in the standard French door fridge is the door-in-door. Other than that, it is pretty standard and basic. It does have some great organization options inside, which may be the highest priority for some consumers. The warranty is also lacking. You get just one year on the parts and labor for the whole unit. When looking at a product, it always helps to learn about the good and the bad. We have gone through reviews to search out the truth as to what consumers love and what they don't love about this model. We highly recommend the Samsung RF28HDEDBSR. We feel you are getting a lot for your money. It is really at the top of this price point as far as the features and overall value. In addition, it is very user-friendly with great organization options. We have gone through reviews to search out the truth as to what consumers love and what they don't love about this model. is Versatile- lots of storage options and organizational features, well-made ​and designed but water filter is difficult to change.